Mamaroneck, New York recently joined the ranks of fellow Westchester County city, Rye, in passing a ban of disposable shopping bags. The Village Board of Trustees in this city of 27,000 located 23 miles north of New York City unanimously approved the law that banishes both paper and plastic disposable bags and will go into action on January 16, 2013. The law gained momentum due to the hassles incurred by plastic bags, such as blocking and clogging waterways and sewers, and the negative impact the bags have on the environment when they sit in landfills. 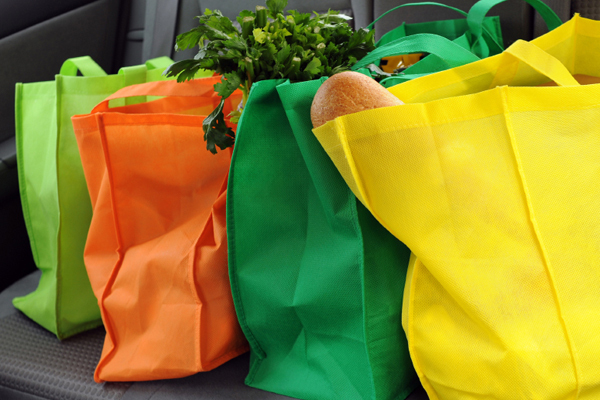 Under this new ban shoppers are able to use recyclable paper bags or reusable shopping bags. The law even goes on to spec out the guidelines for acceptable bags. Recyclable paper bags must contain no old-growth fiber and contain a minimum of 40 percent post-consumer recycled content. The bags must be 100 percent recyclable and have the words “reusable” and “recyclable” printed on the outside. A reusable bag must have handles and is specifically designed and manufactured for multiple uses. A reusable bag can be made out of cloth, fabric or plastic, if the bag is constructed from plastic it must be at least 2.25 mils thick. Having very specific guidelines ensures everyone knows what is and is not acceptable so there is no confusion and everyone plays by the same rules. Mamaroneck’s new disposable bag ban applies to stores, restaurants, farmers markets, sidewalk sales and flea markets. This is pretty far reaching given that typical disposable bag bans just cover grocery and convenience stores and most cities debate about whether to extend their bans to restaurants. To include farmers markets, sidewalk sales and flea markets shows that Mamaroneck means business. Retailers who fail to comply with the law will receive written notification and be given 10 days to correct the violation. If the problem is not fixed after 10 days the violator will receive an additional penalty in addition to a $150 fine. Penalties and fines will continue to pile up for each additional day the issue is not addressed. Again, this detail is more extreme than the average bag ban and it shows that Mamaroneck is serious about eliminating disposable shopping bags. During the warmer months the Westchester County Health Department routinely sends mosquitos from throughout the county to the New York State Department of Health for testing. A mere 4 days after the ban was passed mosquitos from Mamaroneck tested positive for West Nile virus. People can contract West Nile when bitten by an infected mosquito, although this virus is typically transmitted back and forth between birds and mosquitoes. About 80 percent of people infected with the virus will not show any symptoms and up to about 20 percent will exhibit mild, flu-like sickness; however, about 1 in 150 infected people will show serious symptoms and may suffer numbness, convulsions and even paralysis. Flu-like symptoms may last for several days, more serious symptoms can hang around for several weeks and neurological effects can be permanent. In extreme cases West Nile virus can lead to fatal brain inflammation. To combat West Nile virus you have to combat mosquitos and to combat mosquitos you go after where they breed. Mosquitos lay eggs in standing water and it just so happens that stray plastic bags sitting in landfills or stuck in trees and shrubs collect rain and dew and create the perfect conditions for mosquitos to lay their eggs. It is a bit of a chain reaction, but by eliminating plastic bags you eradicate suitable places for mosquitos to breed. If mosquitos cannot breed than there are fewer mosquitos, fewer mosquitos equal fewer of the infected insects that can in turn pass the potentially fatal virus to people. Stray plastic bags are not the only mosquito safe-haven so banning plastic bags will not completely wipe out these insects, but removing other sources of standing water, like clogged gutters or discarded tires, and routinely changing the water in birdbaths or pet dishes left outside will also help the cause. People should also take precautions and wear mosquito repellant when outside. It may seem farfetched that banning plastic bags can save lives, but when it comes to mosquitos and West Nile virus a plastic bag ban can definitely help keep people safe. Disposable bag bans are about so much more than just reducing litter. Bag bans can have a positive change on the environment, communities and it turns out even public health and safety. Read more about Mamaroneck’s ban at http://mamaroneck.dailyvoice.com/politics/mamaroneck-village-approves-plastic-bag-ban. Learn more about West Nile virus at http://www.cdc.gov/ncidod/dvbid/westnile/wnv_factsheet.htm. This is very good news as most of the countries take it easy even small shopping plastic bag can cause disasters . also proves very harmful when milk giving animals like cows and goat swallow the plastic bags which are dumped in many places all over. We at HANDIKRAFTS SOURCING train the rural ladies and also shool and college drop outs above the age of 18years into making of recycled bags made out of used clothes, jute, bananabark raw silk etc which are simple and also cost affective . This training is imparted under our projetc of FAFERWE FOUNDATION which is a CSR initiative of HANDIKRAFTS SOURCING. Anyone wants to take these bags in bulk at very low cost can contact the FOUNDER at saferwefoundation@yahoo.com. KalpanaHeblekar, Thanks so much for stopping by and letting us know about the good work you are doing. Is this considered fair trade?